Pharmacy student Kevin Chen loves that pharmacy provides the perfect balance of opportunities for direct patient care, community engagement, and teaching & mentorship. With so many exciting and diverse career pathways in pharmacy, Kevin believes he will be able to get the job of his dreams. Read our full interview below! I learned I wanted to be a pharmacist later than most students; I realized it when I was a graduate student at the University of Kentucky College of Pharmacy. My interest in pharmacy was confirmed when I saw professors who were able to both practice pharmacy and teach students. I think it is one of the most versatile health-profession degrees available! I aspire to be an oncology clinical pharmacist who practices in a hospital setting, and also holds a faculty position at a College of Pharmacy, so that I may teach and mentor students. I believe that teaching future pharmacists is a critical component of promoting the profession of pharmacy. Prior to deciding pharmacy was the correct career for me, I was able to shadow different pharmacists in a variety of practice settings. This included independent community pharmacy, ambulatory care clinics, as well as inpatient hospital pharmacy. Further, I was able to have conversations with many of my pharmacist faculty members in the College to solidify my decision. Do you have mentors? How did they help? I would not be where I am without the support of my mentors from high school, undergrad, and graduate school. They have been great resources to talk about future careers and finding what best fits my personality and interests. My parents have also been a foundation in my career journey, as they have always supported my desire to find the right career for me. The thing I enjoy most about pharmacy school is the wealth of opportunities available. Ranging from working in a pharmacy, to engaging in student leadership, and even teaching and mentoring fellow students. These activities make pharmacy school more exciting and relevant to the real world. Collaborating with my peers and classmates is one of the most exciting parts of pharmacy school. This commonly occurs when engaging in student leadership. 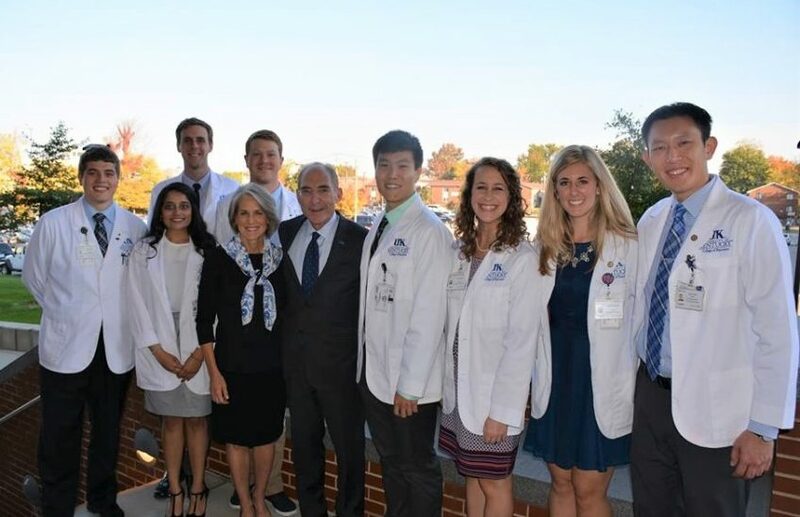 Through collaborations, we are able to set up volunteer events to help serve our community, create professional development activities to enhance our student pharmacist training, and organize social events to de-stress from the rigors of school. The best advice my high school teachers gave me was to “pursue your passion.” Life is too short to spend in a profession you are not passionate about. Don’t be afraid to explore your options! What advice would you give a high schooler who’s interested in pharmacy? My advice would be to see what is all out there for pharmacy! Take time to get to know your local community pharmacists, find opportunities to shadow ambulatory care and hospital pharmacists, and also see if you can find ways to chat with academic and industry pharmacists. There are countless opportunities in the profession of pharmacy, and the best way to find out if you will enjoy it is to learn more about each and every one of them. When I am not studying, I enjoy hanging out with friends, playing volleyball and tennis, as well as trying new local restaurants.